Within comparative criminology, Japan and its relationship to the West can be described as dynamic: the two regions have influenced each other, despite being considered polar opposites. 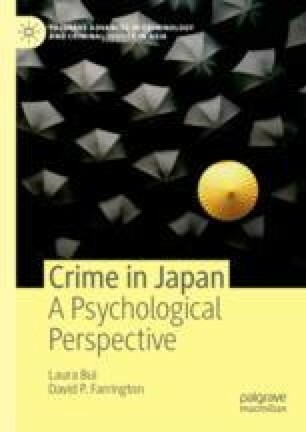 This introductory chapter discusses these influences and the ideas that were persuasive in explaining—even not explaining—Japan’s low crime rate. In addition, differences between psychological and sociological perspectives are introduced, as well as how the two are linked. Mino, Tamaki. 2006. “Ijime (Bullying) in Japanese Schools: A Product of Japanese Education Based on Group Conformity.” In Rhizomes: Re-visioning Boundaries, 24–25. http://espace.library.uq.edu.au/view/UQ:7721.